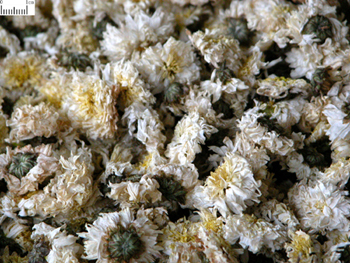 Capitulum of perennial herb Chrysanthemum morifolium Ramat. of family Compasitae. Zhejiang, Anhui and Henan provinces of China. According to difference of place of production and processing method, it can be divided into Bo Ju ,Chu Ju ,Gong Ju and Hang Ju, etc. The Bo Ju and Chu Ju have the best quality. It can also be divided into Huang Ju Hua and Bai Ju Hua based on color differences. Collected from September to November in batch when flowers are in full blossoming. Clear and fragrant smell, sweet taste, slightly bitter. Complete flower, fresh color, clear and fragrant smell, less stalk and leaf. Pungent, sweet, bitter, slightly cold; lung and liver meridians entered. Disperse wind-heat, subdue liver yang, and remove liver heat to improve vision, clear lung heat. As it has the similar action to Sang Ye of dispelling wind-pathogen externally and removing lung-heat internally, it is indicated for wind-heat or warm-heat invading the lung manifested by fever, headache with cough. It is often used with Sang Ye for compatibility. And also for it has mild action of dispelling exterior pathogens, it often used in conjunction with Bo He which has a powerful action of dispelling pathogens, such as Sang Ju Yin in Wen Bing Tiao Bian. 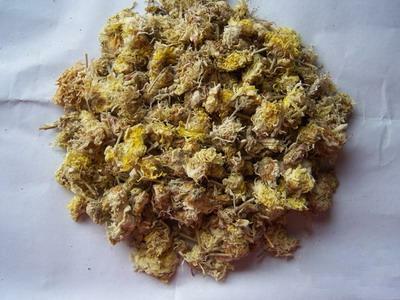 Being able to remove liver heat, dispel wind-heat and improve vision in some degree, it is indicated for the flaming up of liver fire leading to conjunctival congestion with pain and swelling or wind-heat interrupting up leading to unsmooth sensation and pain in the eyes and profuse tears or blindness due to blood deficiency of the liver and kidney. It is often combined with liver-clearing and vision-improving herbs such as Xia Ku Cao and Jue Ming Zi to treat conjunctival congestion with pain and swelling due to up-flaming of liver fire. It is often used together with herbs which can dispel wind-heat and improve eyesight such as Bo He, Chan Tui to treat unsmooth sensation and pain in the eyes because of wind-heat interrupting up. And it is also used in conjunction with herbs nourishing the blood and improving eyesight such as Shu Di Huang, Gou Qi Zi for blurred vision due to deficiency of the liver and kidney, and insufficiency of essence and blood, just as Qi Ju Di Huang Wan in Yi Ji (Foundation of Medicine). Being able to subdue liver yang, and remove liver fire, it can be used with herbs which can tonify yin and subdue liver yang such as Sheng Di Huang, Bai Shao, Ling Yang Jiao, Gou Teng to treat hyperactivity of liver yang leading to dizziness and headache. It also can be used in conjunctions with herbs removing liver heat or dispelling wind to alleviate pain such as Xia Ku Cao, Man Jing Zi to treat the liver fire flaming up leading to vertigo and headache. Besides this, it is indicated for carbuncle and furunculosis internally or externally for its action of clearing heat-toxin. However, for its action of clearing heat-toxin is weaker than Ye Ju Hua, it is rarely used. Decoct 9~15g. It is better to use Huang Ju Hua to disperse wind-heat, and Bai Ju Hua to subdue liver-heat to improve vision.